Date Night in the Kitchen is a new series by Bethany from BethanyGrow.com and The Collaboreat. She and her husband Josh are always on a food adventure, exploring local eateries or whipping something up in their kitchen. I was really excited when Bethany came to me with the idea for this series and I can't wait to try all of the recipes that she's going to share! Once upon a time, my husband Josh and I used to be very creative with our date nights. We were young newlyweds planning out themed nights, romantic picnics with a view of the sunset, and silly games with our favorite childhood treats. At one point we even had a date night jar full of popsicle sticks listing creative ideas to keep us from falling into boring habits like dinner and a movie. But at some point, we each started craving boring date nights of dinner and a movie. We just wanted to spend time with each other, not bending over backwards to try new things and be exciting and creative. We realized we really liked watching movies. We liked the discussions we had afterwards; the way we'd pick the movies apart and discuss the deeper themes, the music score, and the characters we loved and hated. And we realized we really liked making and eating dinner together. We would turn on some music and dance around each other while pouring this and that into our pots on the stove. Then we'd sit down around our own kitchen table or on the couch in front of a good movie and enjoy the fruits of our labor. We discovered new foods, cooking techniques, fun ingredients, and whole cuisines we craved again and again. It wasn't boring at all! We loved cooking together! So we threw out the date night jar and settled on dinner and a movie for nearly every date night. Of course, this routine wasn't always exactly the same every week. Sometimes we went out for dinner and came home for a movie or vice versa. Sometimes we ditched the movie and played Nintendo 64. Sometimes we'd go out for dinner then come home and cook up an elaborate dessert. We managed to try something new and shake up our date nights while still doing our favorite things week after week. Cooking quickly became our favorite activity to do together and thankfully so, because when our finances changed and we had to cut back on our spending, we knew we could still have fun date nights because we so enjoyed cooking homemade meals together. We still dance and chat over the stove and savor the meal at our kitchen table. And it's still just as fun as it was years ago when we ditched our cutesy themed dates and romantic sunset picnics. So starting today, I'll regularly crash the party here on A Prioritized Marriage to share some amazing date night dinners you can make and enjoy at home together. Some might be quick and easy (like today's recipe) where you can focus more on spending time eating than working in the kitchen. Others might be more involved and give you the time to put on a good album while you work together. Some might be romantic or exotic or nostalgic or taste better than that dish you would order at that one restaurant. Either way, these meals make for a great date night with your spouse. So save yourself some money, bond over the stove and the new foods you'll try, and cook together at home! 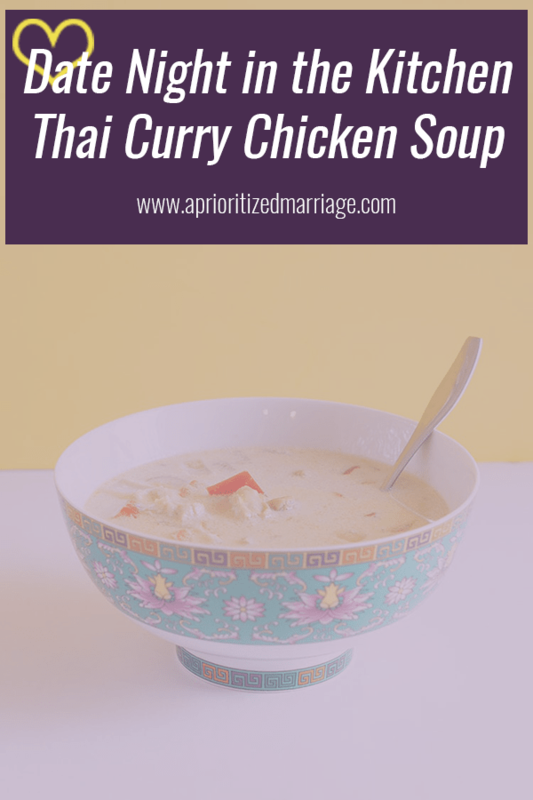 Today's dish is a favorite in our house: Thai Curry Chicken Soup. It's a set it and forget about it crockpot recipe that is so easy yet leaves you with loads of leftovers you can't wait to eat for lunch the next day. I have to pace myself in putting this soup on our meal plans because I don't want to get sick of it. I love it too much! And more recently, we started making the greatest Quick Thai Curry Biscuits to go with it that definitely compete for the star role. Together, the meal is still very simple and quick, giving you more than enough time to put on your favorite movie and relax. And I dare you to not finish all 24 biscuits that night. They're THAT good. In the bowl of a slow cooker, whisk together the curry paste, coconut milk, chicken stock, fish sauce, brown sugar, and peanut butter until smooth. Add in the chicken, pepper, onion, and ginger. Cover and cook on high for 4 hours or low for 7-8 hours. * In a pinch I have used yellow and green curry pastes in the past and it tastes just fine! Just depends on the type of curry flavor you want. Red curry paste is strongest and makes the soup look pretty, in my opinion. ** 2 12oz. cans are also acceptable. Make sure to use the full fat, unsweetened coconut milk (NOT cream of coconut or the coconut milk that comes in a carton in the dairy section). Before you open your cans, make sure you can shake it and hear the milk sloshing around. If it has separated and hardened into thick cream, it will not work. *** A box of organic low sodium chicken stock is best. Low sodium will make sure the soup is not too salty. Of course, in a pinch chicken bouillon (mixed thoroughly with water) or any box of chicken stock will work. **** Chicken breasts will work if you cook on high for 4 hours. However, chicken breasts in general become overcooked when cooking for that long. Thighs will stay tender and juicy for longer and hold up better. ***** You can serve your soup curry style over rice or without rice in a bowl as soup. We generally prefer it as a soup but sometimes serve it with rice when we need to make the soup last longer.